If there’s something that comes and goes from our lives (besides money, luck, and people), it sure is the inspiration! We know how difficult finding something that hasn’t been done before is, but luckily no one ever got hurt from getting inspiration from one or another. 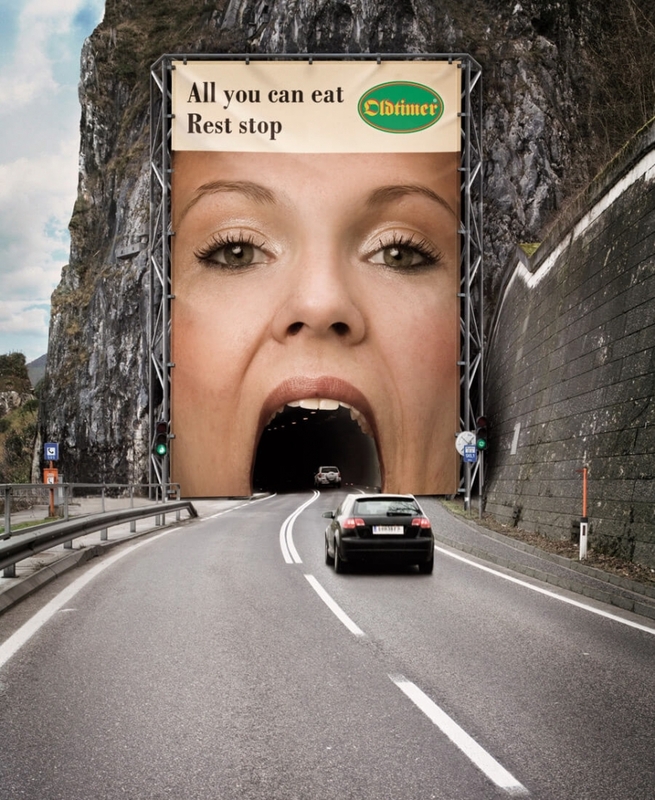 That’s why in this article we’re bringing into spotlight 50 great advertisement ideas from which you can get your inspiration! Something that is shown or presented to the public to help sell a product or to make an announcement. Of course, this is the scaled down definition of everything that advertising represents, but it shows the most important reason why people are practicing it. Selling! What types of advertisement are out there? If we’d be living in 1950, you’d probably be reading this article in a newspaper or a magazine. At the beginning of advertising times, there was lots of text in the ads, and the primary method of advertising was proving the authenticity of the products presented in the ads, by mentioning doctors and professors that could vouch for the products. If we were in 1950, in this chapter, I would only talk to you about printed ads, radio and if you’re lucky a bit of TV! 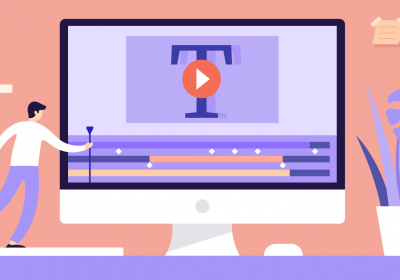 But nowadays, with the help of technology, there are so many types of advertisement, that marketers and advertisers become overwhelmed. And even more, there are more types categorized by different criteria like channel or purpose. 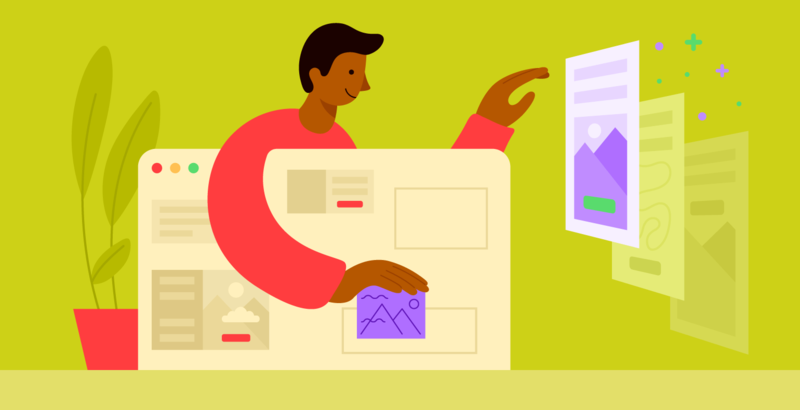 We’ve put together a collection of 50 advertisement ideas to get your creative juices flowing and start a great marketing campaign! To get started, just go to our online advertisement maker and create your next great ad. 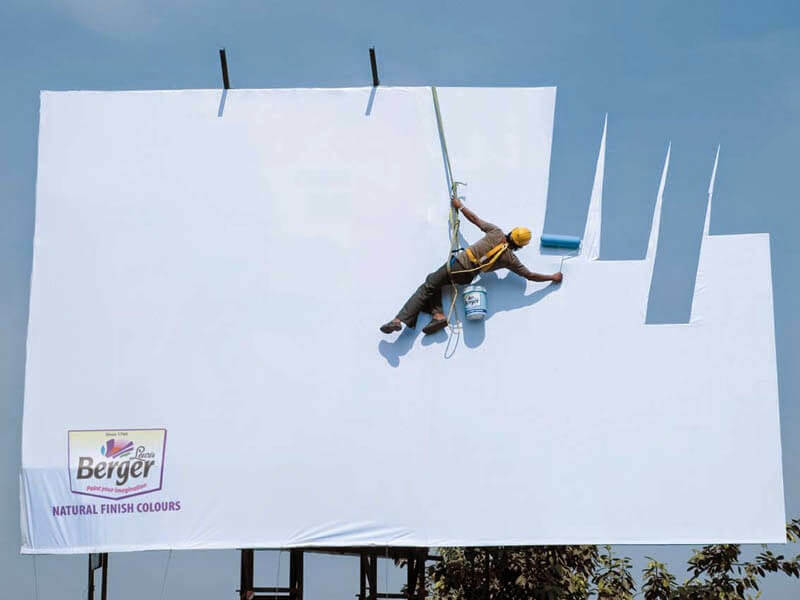 Billboard ads are a classic way to promote your product, but with a twist of creativity, they can become great ways to get noticed. 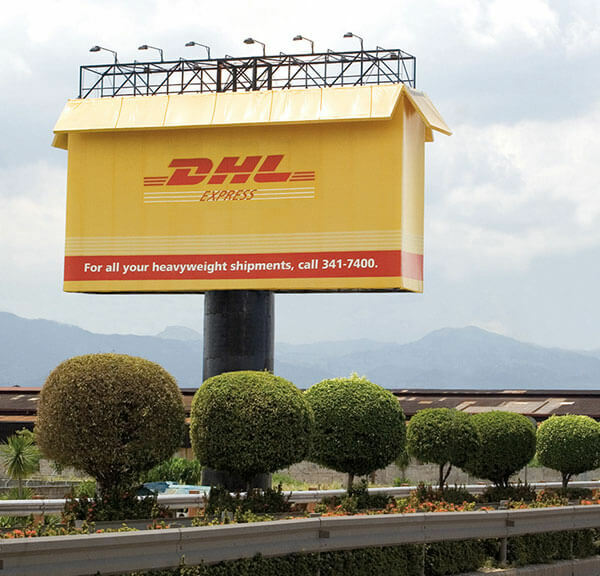 Check out how companies like Bic, Prestige or DHL used their products shape as billboards to get attention. How to showcase a products advantages? 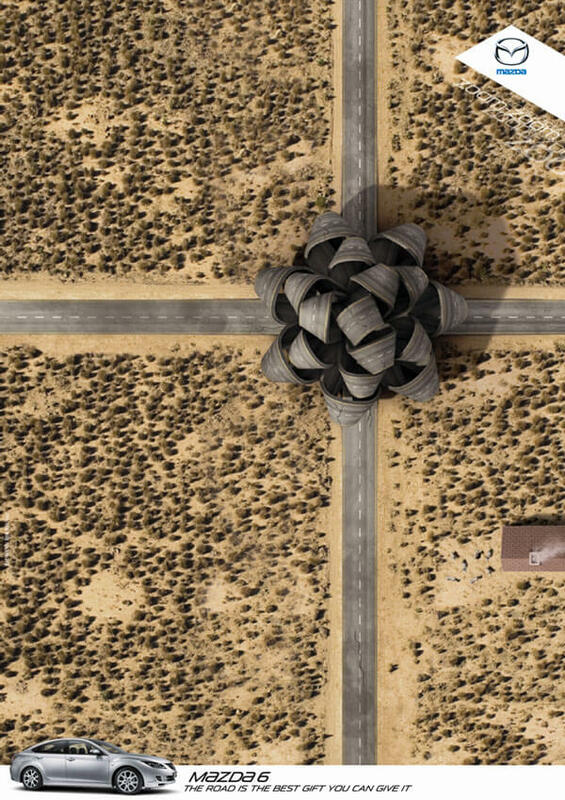 Here’s a creative way you could do that with a billboard. 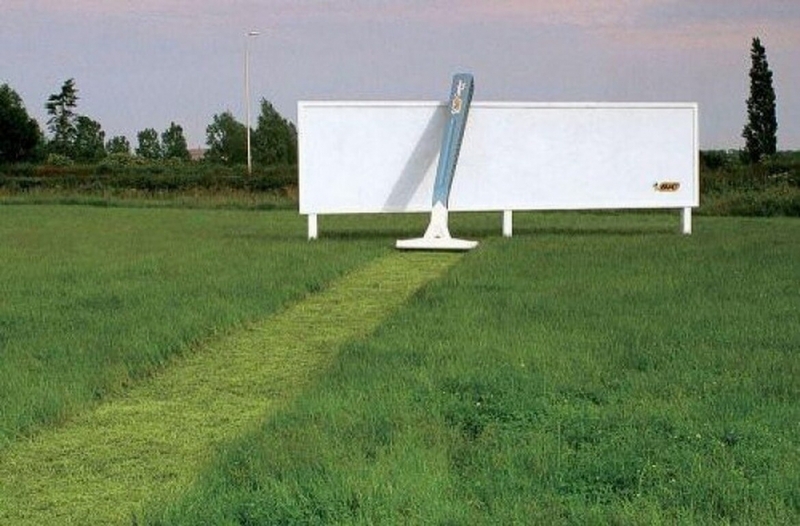 An all time classic billboard inspiration from Bic, where the lawn and the context says more then the billboard itself. Use the colors of nature to talk about the product you promote. 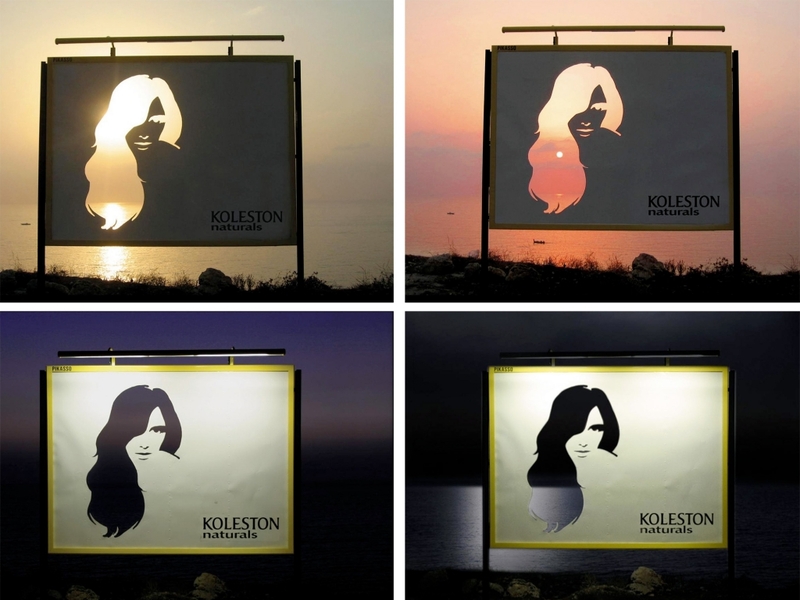 With a touch of creativity, you can come up with a masterpiece like this creative billboard from Koleston Naturals. Why not pack your billboard? 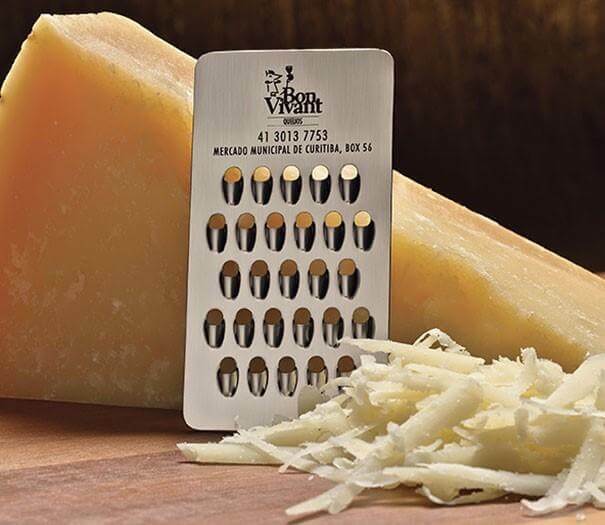 It’s a fun and creative way to remind your customers what you’re all about. 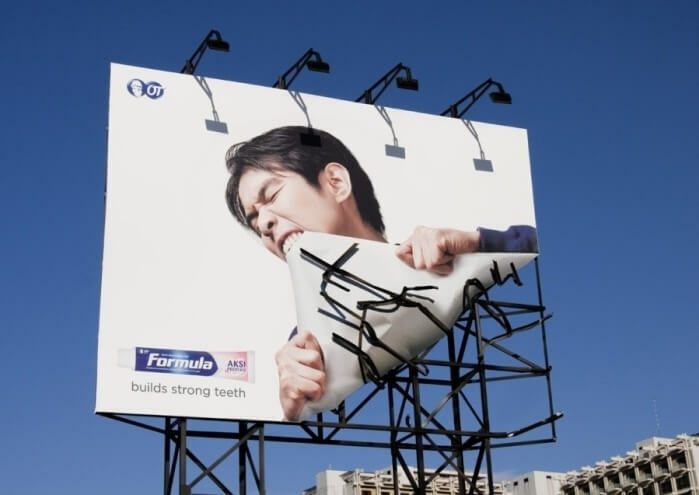 A creative way to promote your product is to use the billboard in order to showcase some of the advantages of your product. You can use the color of the sky, the birds or just the billboard itself as a part of your commercial. If creativity is what you’re looking for, you don’t have to stick to the classical rectangular shape. 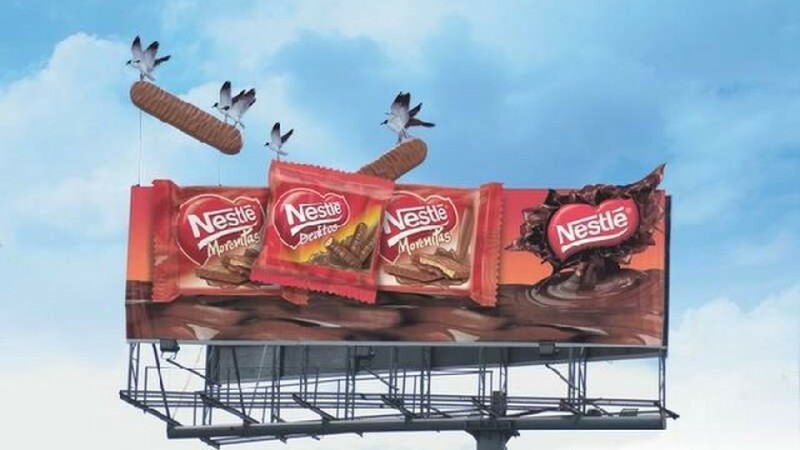 Get inspired by this Nestle billboard! 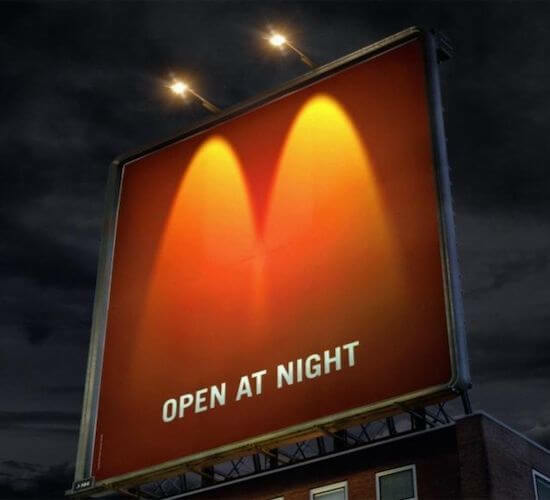 McDonald’s had a really creative idea to promote the fact that they are opened at night: using 2 lights to recreate their logo certainly got everyone’s attention. Buses and trucks work great as billboards, and since they are always in motion, the visibility of the product they promote increases every day. 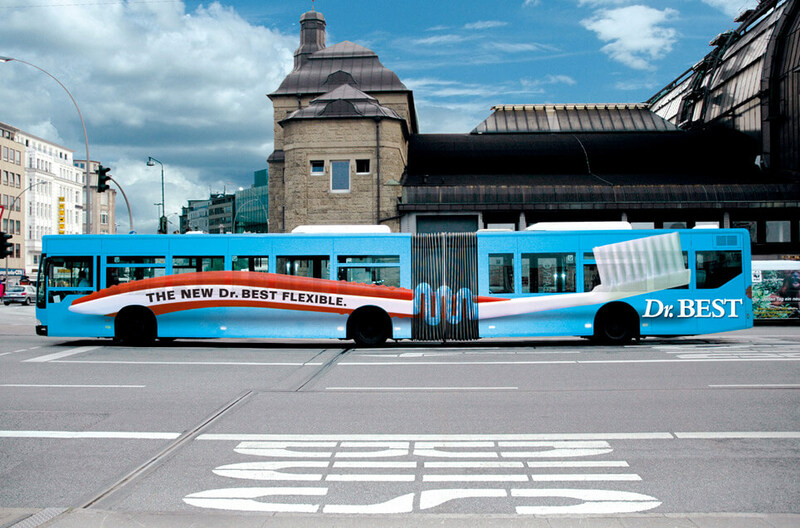 Some brands found incredibly creative ways to attract everyone’s attention with huge all-around prints, while others made use of the bus shape to enhance some features, like the new Dr. Best Flexible toothbrush. What do a toothbrush and a bus have in common? Flexibility! 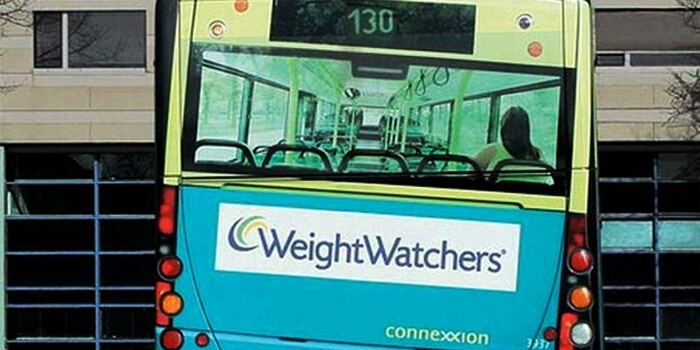 Here’s a great example of bus advertising done right! 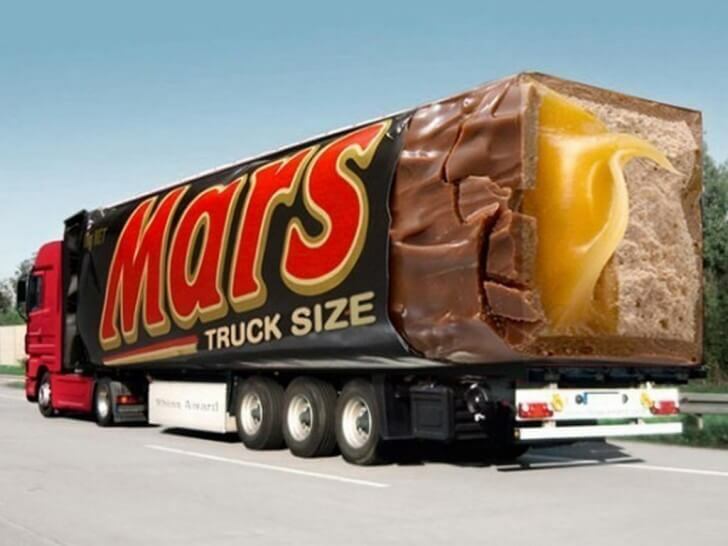 Mars made this great truck commercial to promote its new truck size chocolate. Looks so appealing! 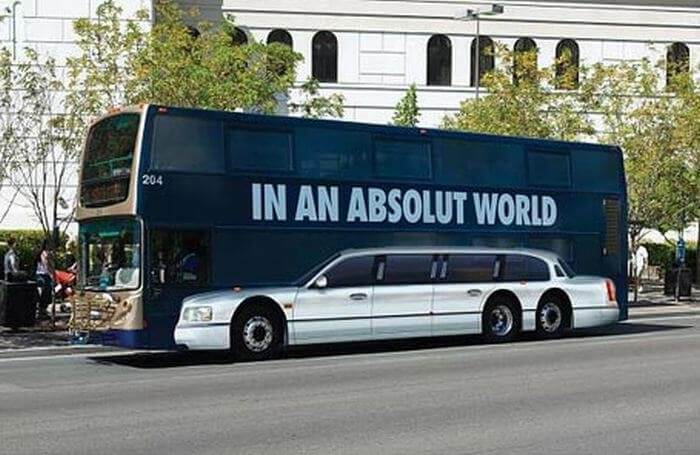 For their campaign – “In An Absolut World”, the famous drink brand showcased a limousine instead of a bus, to picture an ideal world. 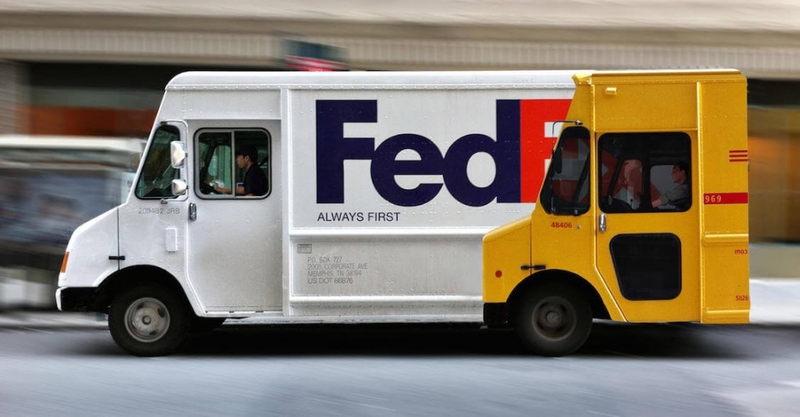 FedEx found a unique and subtle way to make fun of the competition with their creative bus advertisement. Some brands found creative ways to use the places where people spend time, transforming them into a unique and unforgettable experience. 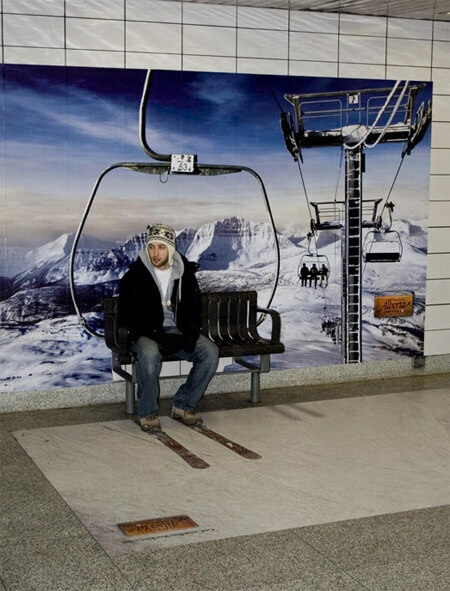 Bus stations became ski lifts, aquariums or mobile phone chargers in the vision of some really creative advertisers. Why not plan your next vacation while waiting for the bus? 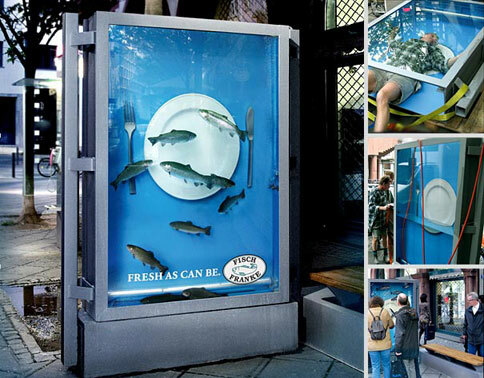 Here’s a creative bus stop advertisement example. 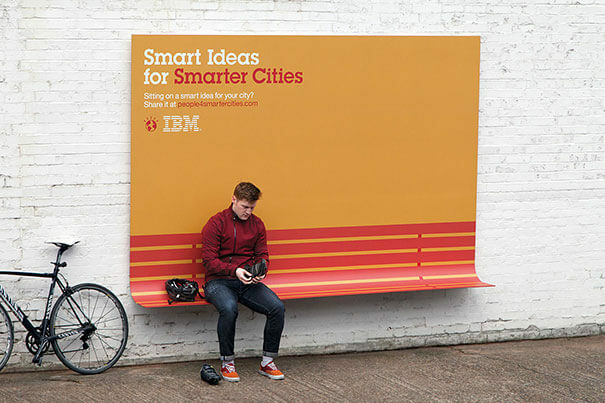 The idea of making a billboard that is actually useful is brilliantly applied by IBM with this cool concept. 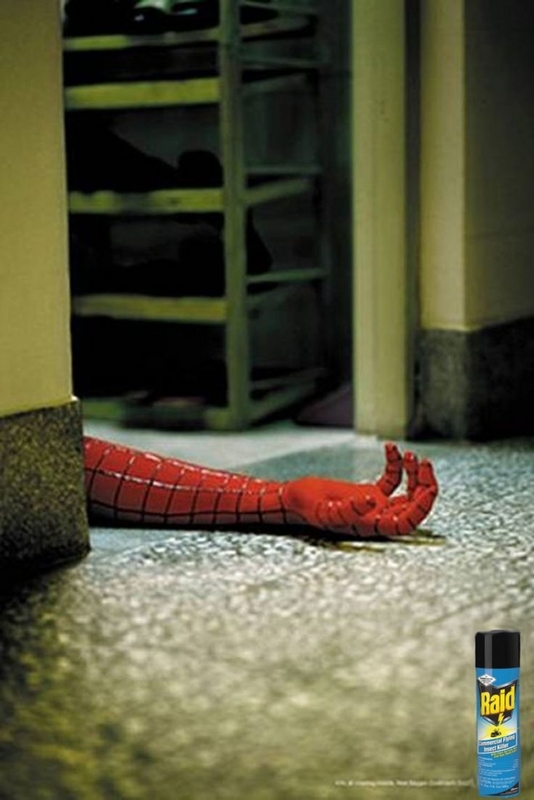 Check out how Vitamin Aqua found a way to be useful while still making a point for their brand. 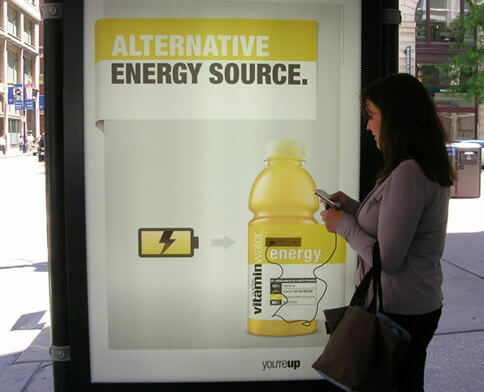 They offered a place where you can charge your phone, to remind you how you can gain energy from their drink. 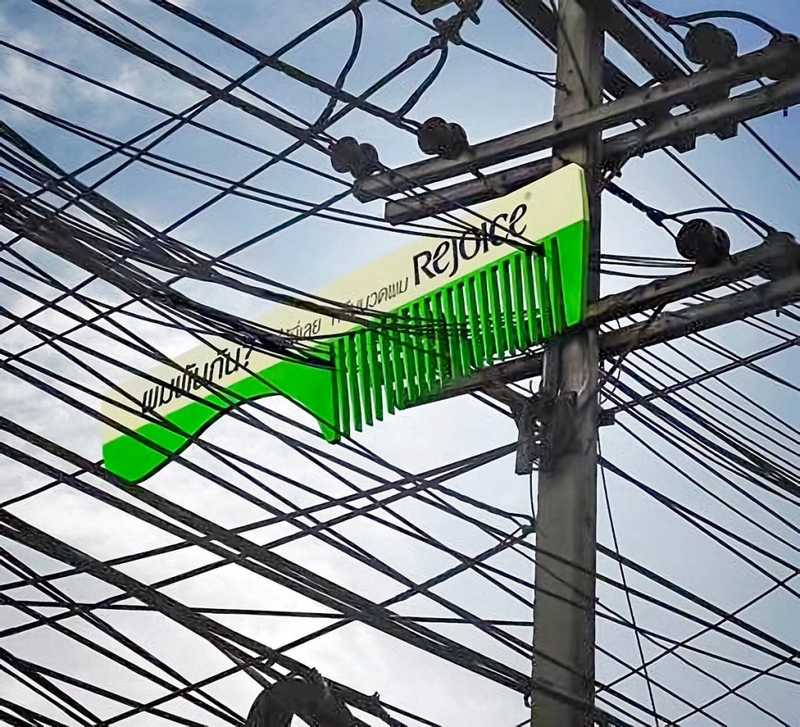 Ambient advertising has no limits when it comes to getting people’s attention, and often it finds a way to use the environments faults to showcase a product’s utility. 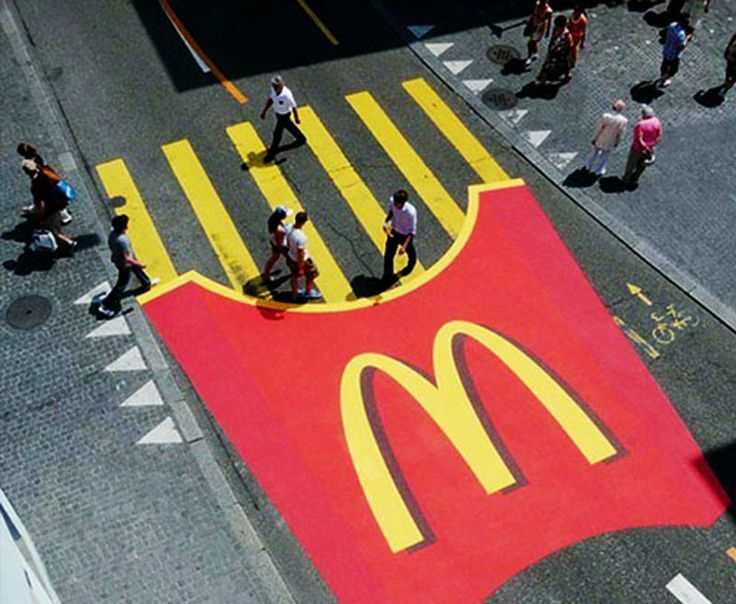 Another creative example was created by TBWA for McDonald’s, in Switzerland, during the Zurifest. Here, the crosswalk was transformed into the iconic fries, to get people’s attention. 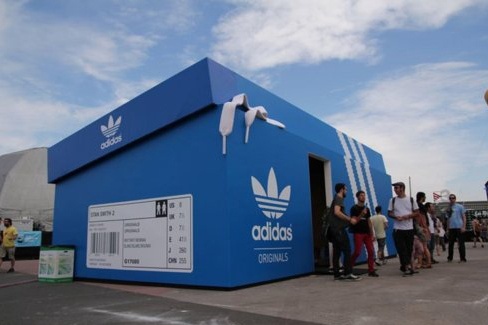 In Amsterdam, Adidas made a pop-up store that looks like a giant shoebox. It’s all in the details, the store even features some over-sized laces peeking out. Creative business advertising ideas always stick in people’s heads. 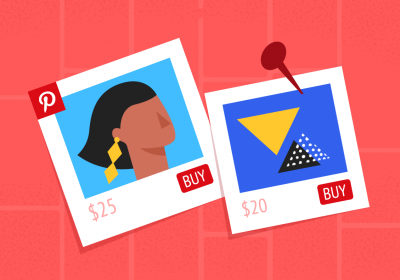 Try to showcase your product in a unique way and don’t forget to think outside the box. When you are on the road and you get hungry, you really can’t miss this huge Oldtimer All You Can Eat Rest shop sign at the entrance to a tunnel. 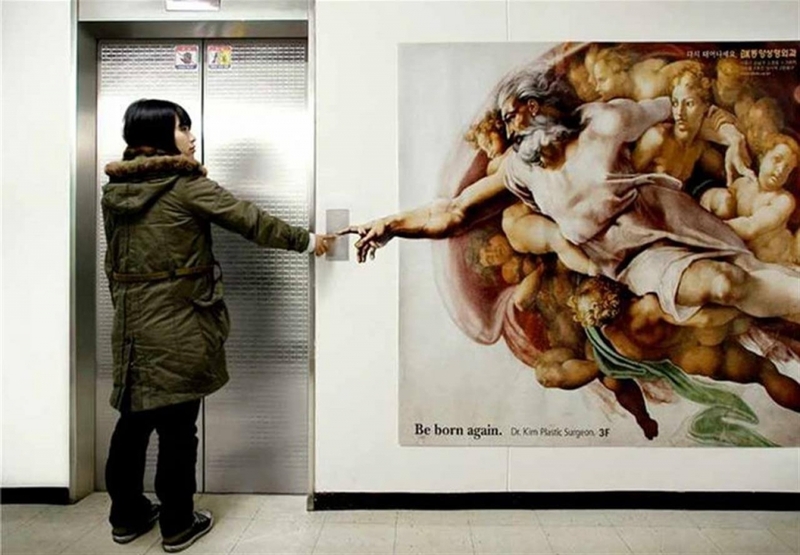 Guerilla marketing campaigns are all about creativity and finding unconventional spaces to place your ad and make a point. 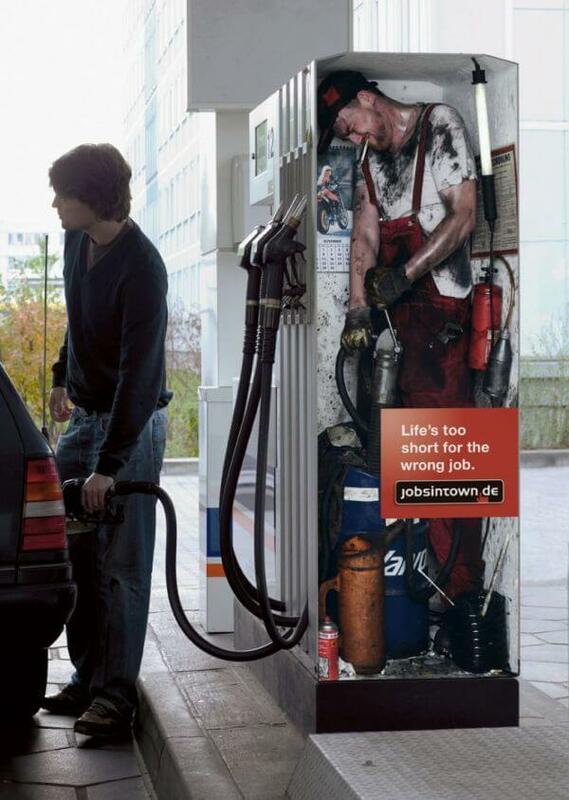 Jobsintown.de, a German online recruitment website, made an original advertising campaign to inspire people to find better jobs. It showcased people doing the jobs of machines and really makes you think about how work will look like in the next decade and what’s your role in your job. 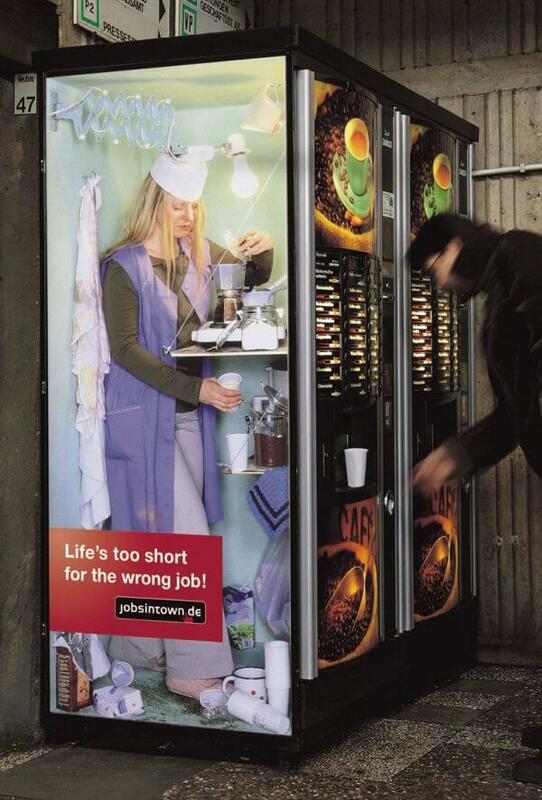 Don’t settle for a job that’s not suited for you, that’s the message of this creative campaign; here, you can see an imaginary inside of a Coffee Machine. 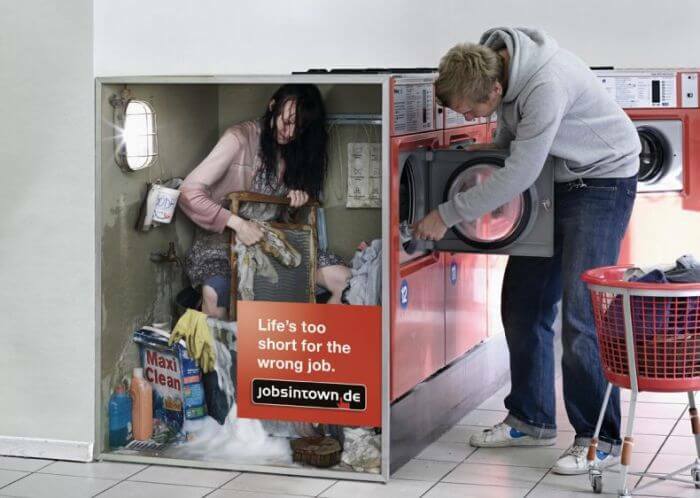 The Guerrilla Marketing classic campaign continued with more examples of awful jobs; imagine how it would be to work inside a laundry machine. When you’re in the wrong job, you might feel like this character: doing a useless job you don’t like and that could be done by a machine. This is the campaign’s brilliant way of making you aim for a better job, by showing you the worst jobs. Advertising on products and creative packaging designs are new trends nowadays. Here’s a creative advertisement on a drinking straw promotes Y+ Yoga Center, also made by Leo Burnett. 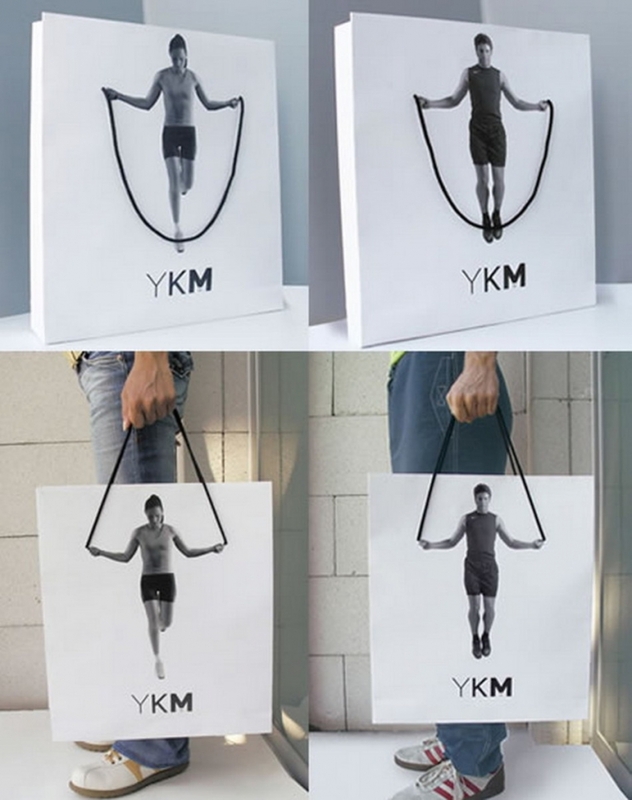 Here’s another great example of how to promote a gym with a creative and unique packaging idea. Here’s a business card that is actually useful, so you won’t lose it in your wallet somewhere. 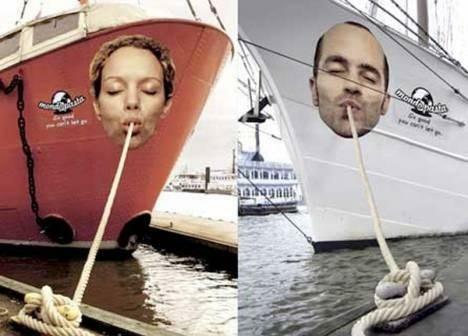 Here’s an intriguing and creative example of product advertisement: it’s all about pasta! 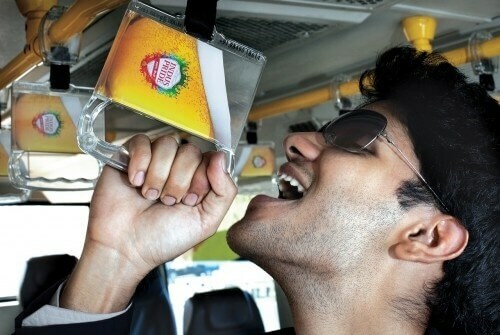 Creating an ad that’s both useful and suggestive isn’t always easy, but Indus Pride did an excellent job with these beer holders. What better place to be inspired to do some more shopping than the mall? 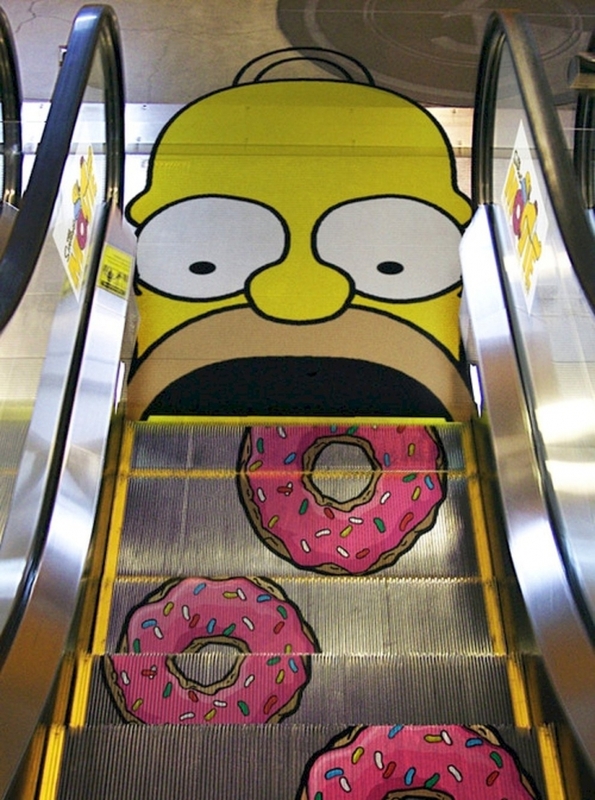 Here are some really creative examples that use the stairs, the elevators or the floor inside malls in clever ways, to get attention. See how movie characters come to life within the mall and make you want to buy some movie tickets asap. 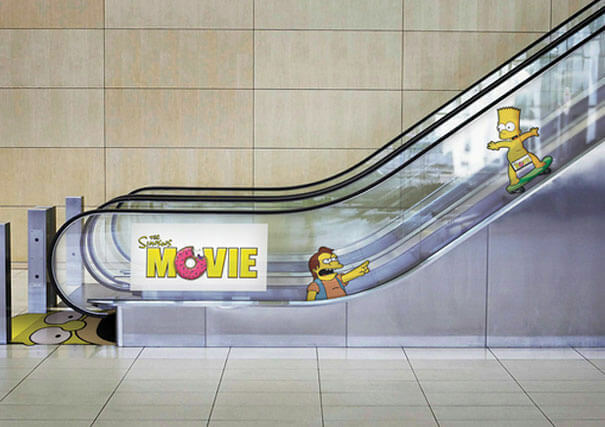 That’s what we call a creative marketing campaign! Sometimes an image is worth 1000 words… or was that donuts? 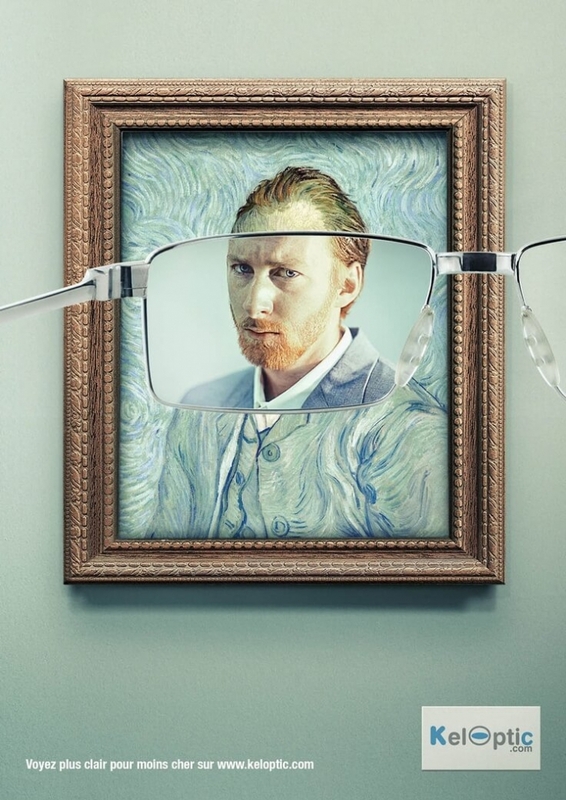 The concept is bold and suggestive at the same time, using one of the most well-known paintings of all time! 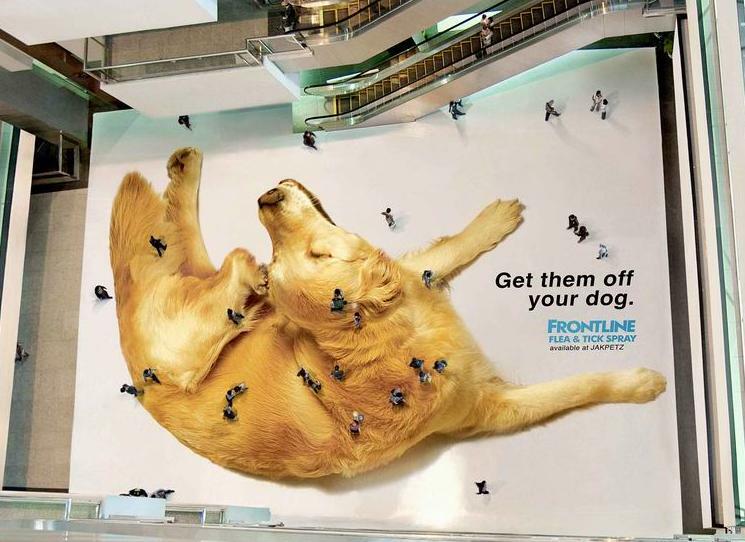 This great add example from Frontline is fully visible only from above, but it’s very suggestive. 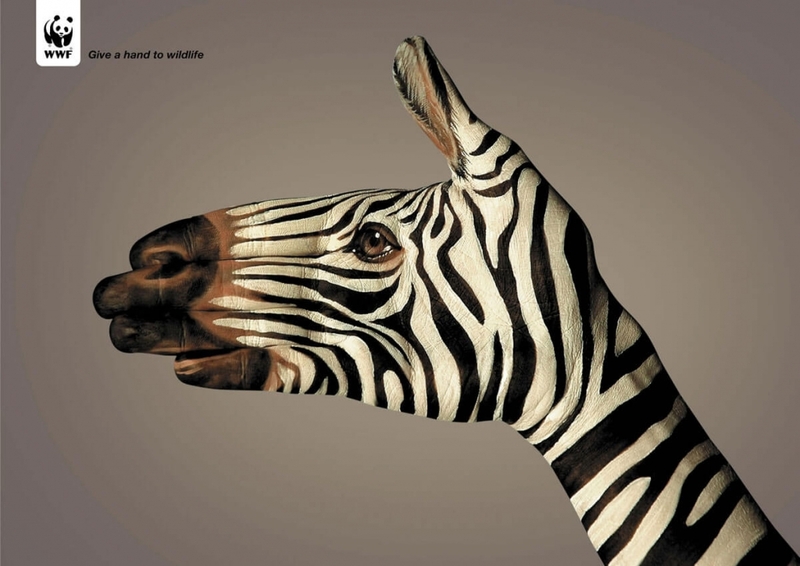 When you have no inspiration, you can go ahead and check some creative visual ads for print and online. Here, the sky’s the limit to what you can show. Some of the great examples below make use of clever, unusual associations and word games to make a clear point, while others are just really funny. Here’s a great advertising idea only pet owners will understand. Sometimes it’s ok to make fun of your own product. Here’s a funny Raid Ad that’s guaranteed to be remembered. Here’s an inspirational poster on wildlife and how we can all make a difference. 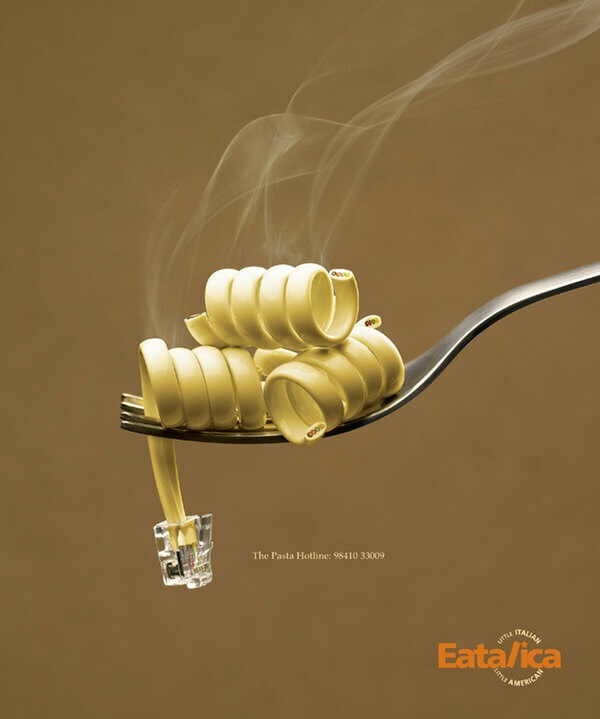 Creative and funny ad from Eatalica known as the pasta hotline. 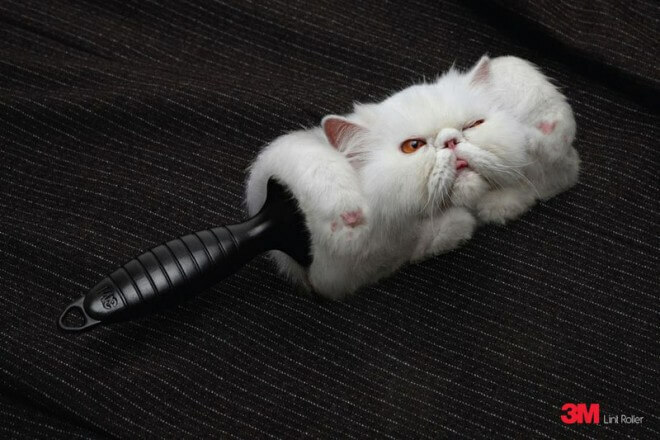 Creativity at it’s finest – or how to illustrate an advantage of your product with very few words. 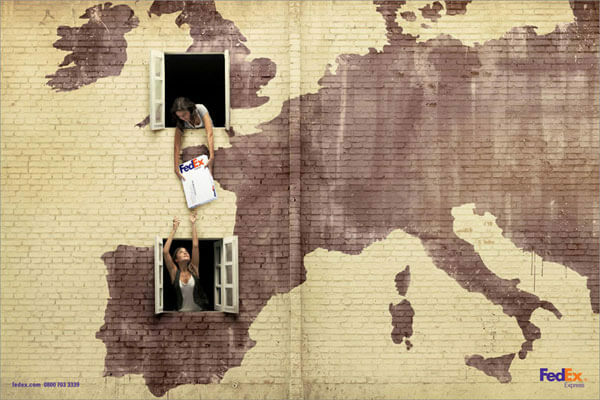 Nivea has always been an example of creativity and inspiring advertising, and this ad makes no exception. Wondering how to tell a story using a creative analogy? 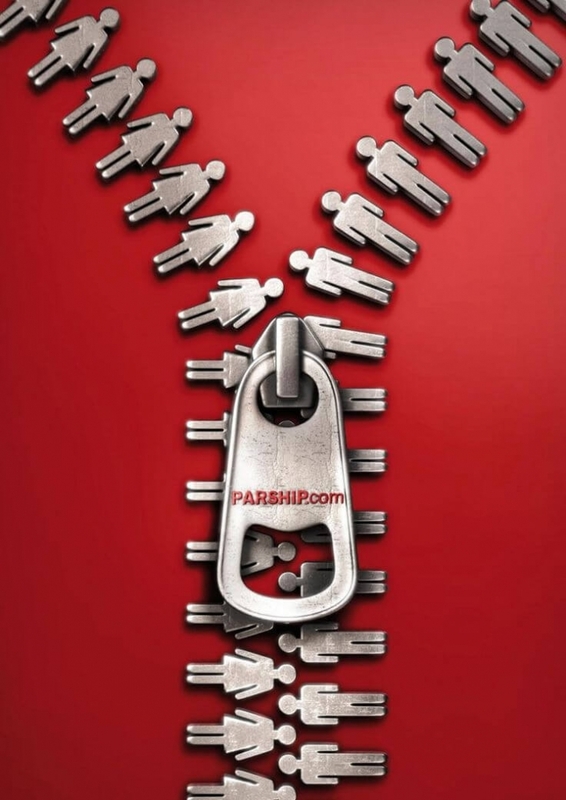 Here’s a great example: a cool print add for Parship.com! A graphic illustration of how forests are the lungs of the earth. Art always makes a huge impact, so everything art inspired can make a great impression. Here’s an ad that’s really suggestive! 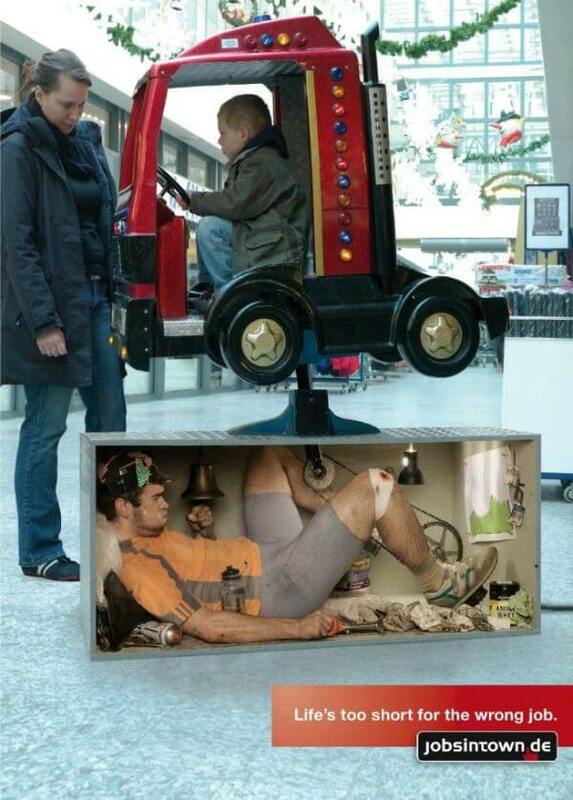 Stop dreaming and start riding is the message behind this creative advertising example. A print ad that became as legendary as the motorcycle company itself. 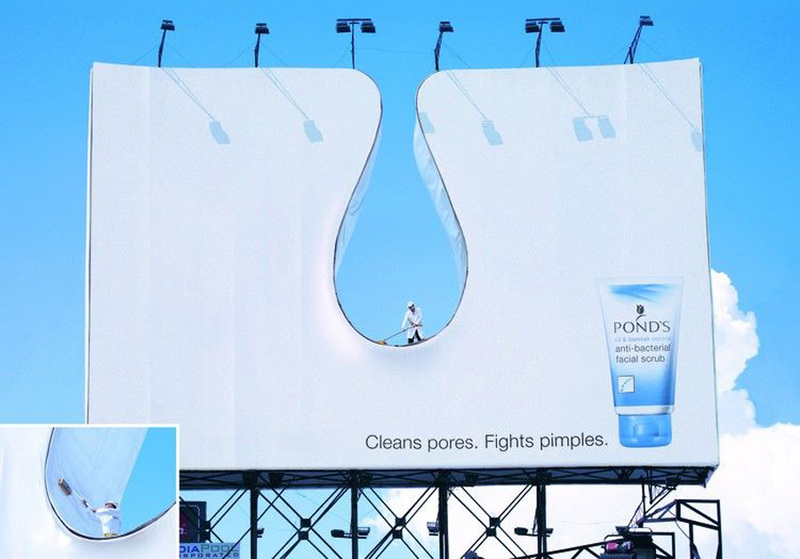 A great way to showcase how boundaries disappear with the right advertising. This cool Mazda commercial speaks for itself. 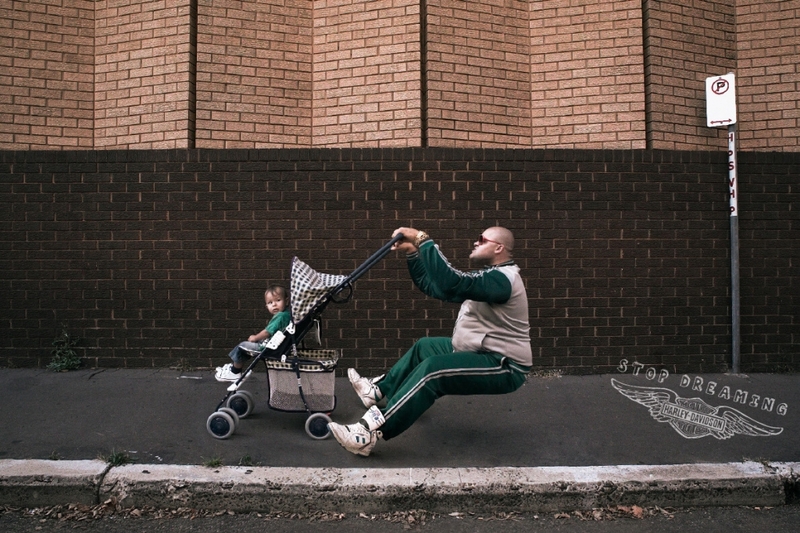 It was created for Mazda 6 by Saatchi & Saatchi, and it’s a cool photo manipulation and source of inspiration. 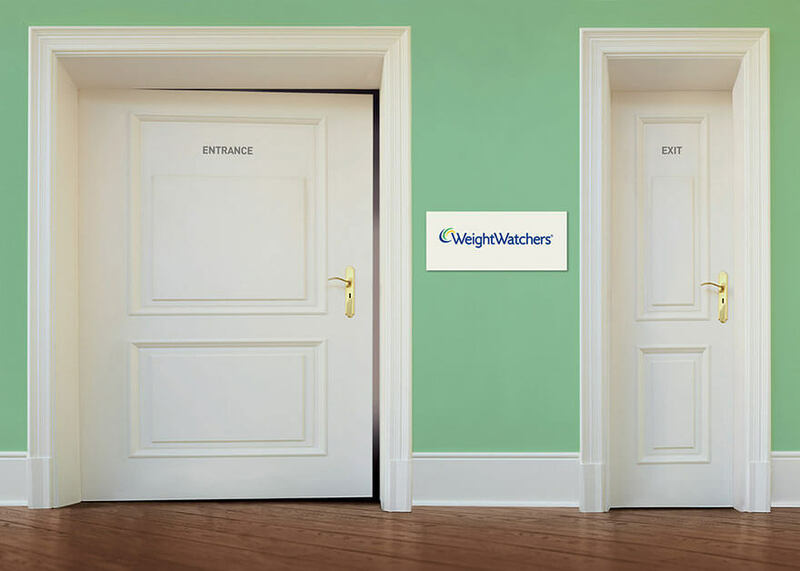 Weight Watchers comes back to our top with a not so subtle print that shows a solution in a clever and funny way. 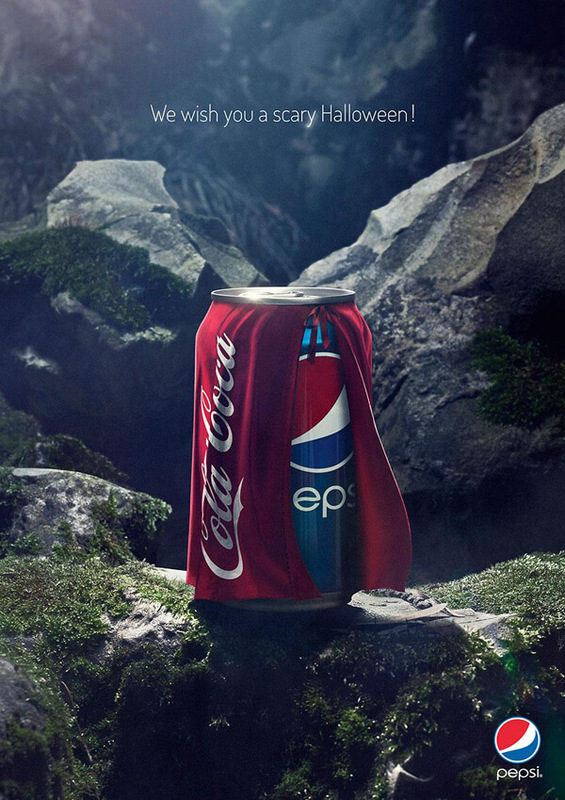 One of the most creative examples of how to use the power of competition to stand out can be found in the iconic competition between Pepsi and Coca-Cola. Here’s one of our favorite Social Media posts from Halloween. 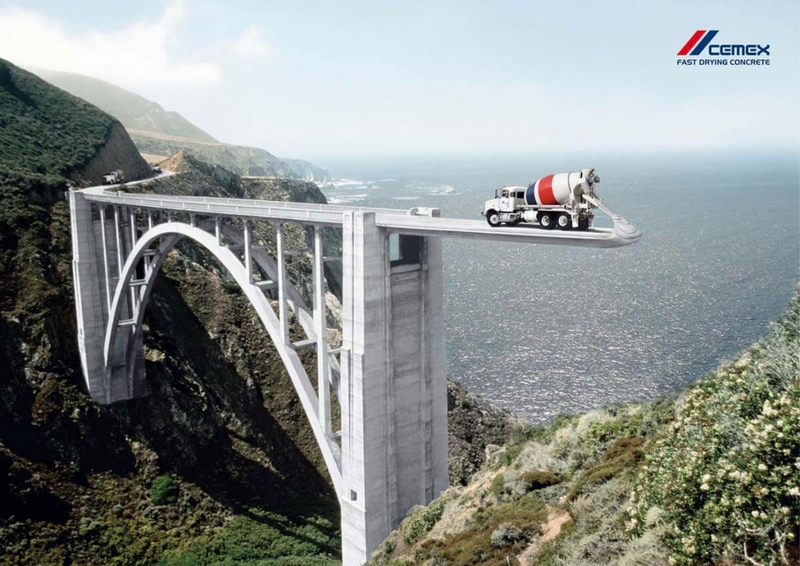 We hope these examples of good advertising ideas will be great sources of inspiration and motivation for you when you have to create a marketing strategy! Let us know whether you tried any of these and if it worked. 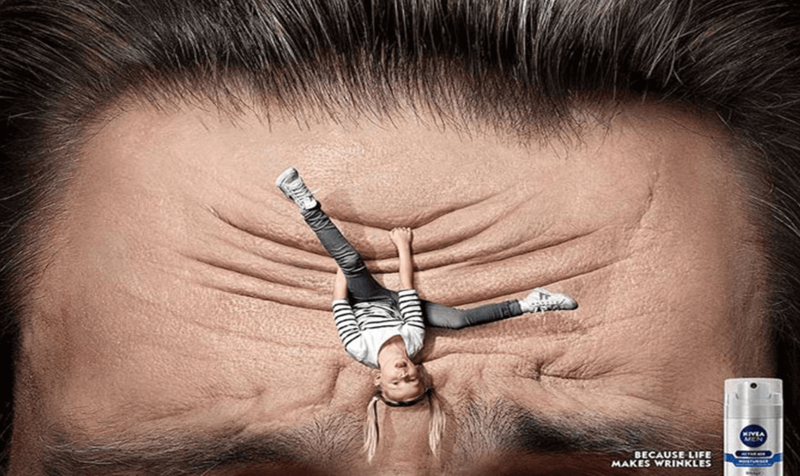 Very creative and inspiring Advertisement Ideas collections. Thanks a lot to you for sharing with us. Thanks, glad you liked the examples! Have an inspired day! Great examples. The one with the dog is very creative. 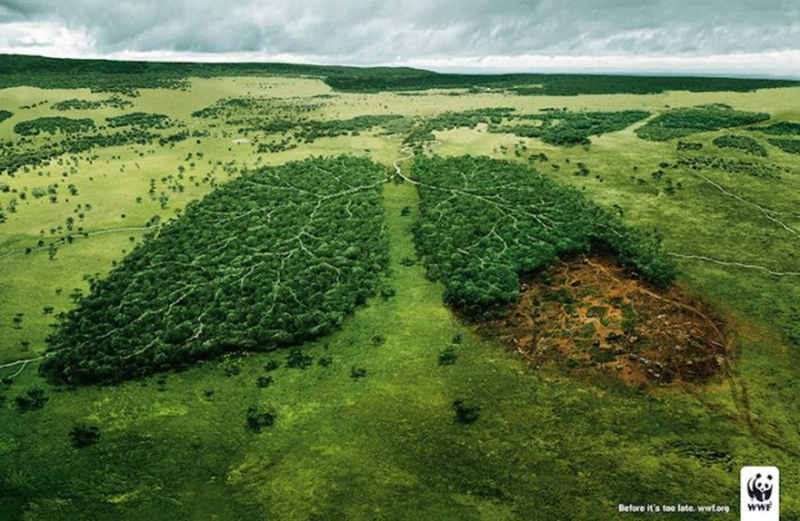 Impressive advertisement ideas, especially the ones with forest as the lungs of the earth. Hi, Kanika! Thanks for writing! If you are running out of ideas, you can create an account on Bannersnack.com and start from one of our ads templates, maybe you’ll find something you like. Hey Gabriela, Thank you for sharing these advertisement ideas. I just want to tell that you have missed one of the important point about advertising that is the importance of outdoor advertising. Why it is important and what are the affects of outdoor advertising? Thanks, Kevin! Great point, I’ll update this blog or write a new one on this issue, thanks for the suggestion! 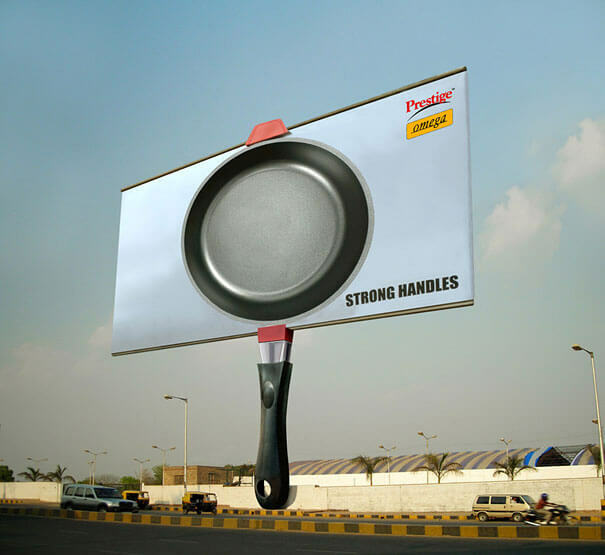 The most standard of the outside advertising choices, these displays is the muse of a eminent out-of-home media campaign.billboards, advertising posters, walls, bus and rail media, street article of furniture, specialty accumulation, digital, mobile billboards, sports media and additional – that area unit certain to suit your wants. 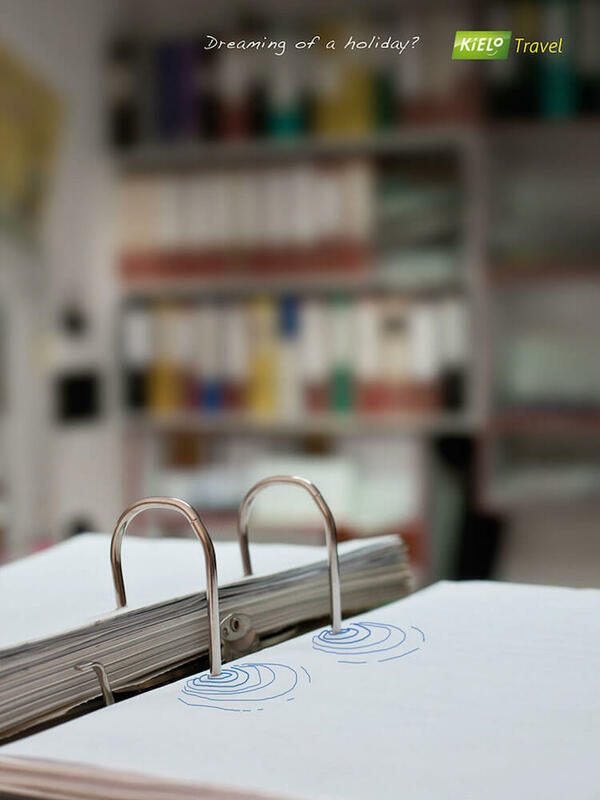 Our intensive portfolio in addition to our premier locations provide associate unequaled coverage by market than the other out-of-home media vender.